Treb's Blog Stop: Uh Oh... On My Back Steps!!! The election has made it to my back steps. Literally! I was between stops going from place to place today and noticed a motorhome parked behind my house. 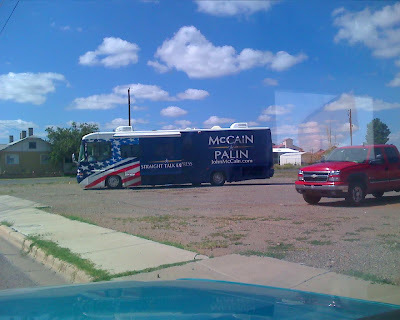 I doubt seriously that Senator McCain is in there, but hey... When is it going to happen again? I snapped a picture to preserve the moment. Too bad Senator Obama wasn't there, we could host a mudslingin' contest! That would be cool but I think I would have to call the cops. I don't mind it being in the neighborhood just as long as they don't throw any loud republican parties.